Castellina in Chianti is one of the top destinations for anyone wishing to stay in Chianti near Siena. The small city center, part of the Chianti Classico wine region, is surrounded by vineyards and wine producing estates that also offer accommodation. The city center itself is small but with lots of small shops and restaurants that serve the needs of local residents and visitors alike. Most of Castellina had to be rebuilt after World War II, but the town maintains its charm and several distinguishing characteristics such as Via delle Volte, an underground tunnel built within the defensive walls. From within, guards could observe the surrounding countryside for the approach of uninvited guests. Today, you can walk down the tunnel with its small shops and also observe the same enchanting views - but without the worry of approaching enemies! 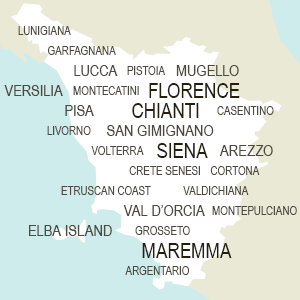 The town and area is easily reached by car by either following the Via Chiantigiana or "Chianti road" from either Florence or Siena or by exiting at Monteriggioni or Poggibonsi off the Florence-Siena road and following signs to Castellina. The best way to get to Castellina is to drive there; it is unfortunately poorly served by public transportation. The closest train station is called "Castellina Scalo", about 11km from Castellina in Chianti. If you're staying in the countryside, a car is definitely recommended and will make moving around Chianti and its vineyards and wineries very practical. The Enoteca Antiquaria, located in the stately Palazzo Squarcialupi in the center of Castellina in Chianti, is an important wine shop in the entire Chianti region. The wine shop's collection includes Chianti wine from the last 100+ years, thus becoming an important historical archive of Chianti Classico wine itself.